To purchase your club membership in person visit Napa Autopro (Adam McDonald), Franks Mechanical Service (Frank Douthwright), or Nicola Motor Sports (Grant Klassen). If you are purchasing online and it says "This email address has already been taken" click on the "Forgot your password?" link to set up your BCSF account. The Secondary and Youth memberships require their own email address different than the primary. Note: Memberships and day passes DO NOT include liability insurance, that must be purchased separately through an approved insurance broker ie. Oasis, Interior Savings insurance, Capri Insurance ect. Also when getting your liability and snowmobile insurance you may be entitled to a discount for having an AST1 course, Safe Snowmobile Operators Training, or being a member of the club. Money collected from Membership fees, and Day Passes help fund trail signing, trail maintenance,maintenance of our club shelters,annual Club Insurance costs, other club operational costs,and the ever increasing cost of fuel for the groomers. By joining the Merritt Snowmobile Club, you are choosing to support snowmobiling in BC and ensure that we have areas to ride for future generations. 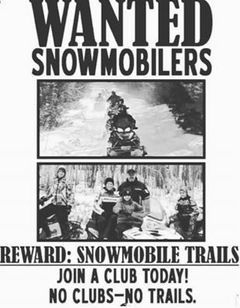 So while many people join the club for a groomed trail there is more to snowmobile clubs than just that. The volunteers in clubs negotiate with government to manage these areas and work hard to meet the ongoing requirements of these agreements. There are many well-funded groups getting organized and advocating to have us removed from the backcountry. We need to stay organized, have strong membership numbers, and support the volunteers that keep this all going so that the people that just want to ride can. Your local club has many opportunities to get involved. You could volunteer to be a Director, help with an advertising campaign, provide some accounting advice, fix a piece of equipment, repair a shelter, work a snow show booth, or just step up and cook hotdogs at an event. Clubs are driven by volunteers and everything you see or do while riding is as a result of someone having volunteered their time. Contact your club or attend a meeting if you want to help.